Neither agents nor sellers determine a property’s market value: Fair market value is determined by that (highest) price a qualified, reasonably knowledgeable buyer is willing to pay at a specific point in time, after the home has been properly exposed to the market. An agent’s comparative market analysis (CMA) attempts to estimate today’s fair market value by an honest assessment of the property’s location, size, condition, amenities and emotional appeal, in the context of current market conditions and trends, recent sales, competitive listings and properties that did not sell. The vast majority of buyers and agents will not make offers on homes they consider significantly overpriced. 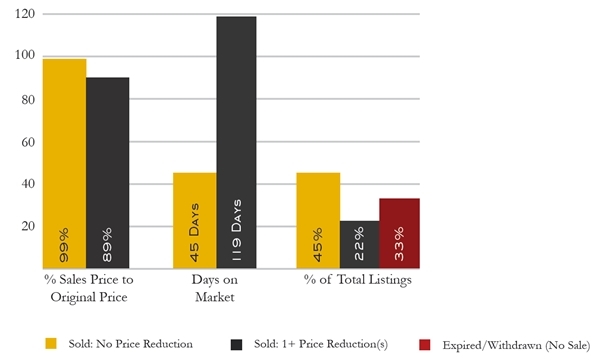 Almost all home sales in San Francisco sell within 3% to 5% of the last asking price (including any price reductions). This sample breakdown of San Francisco home sales below illustrates the large discount off original list price and the big increase in days on market, as well as the significant proportion of listings that don’t sell at all, when the listing is overpriced to begin with. Choose an agent based upon experience, references, the quality and honesty of counsel delivered, the comprehensiveness of marketing and preparation plans, his or her transactional and negotiating skills, and the explicit commitment to work hard to protect your interests.